This installment of the Campaign Elements-series clocks in at 22 pages, 1 page front cover, 1 page SRD, leaving 20 pages of content…so what do we get here? The answer to this question is surprisingly simple – we are introduced to a new deity, including all those things that accompany her. Lady Kala Môr is a neutral deity of Darkness and the Upper Air, whose portfolio also includes protection and secrecy – from clerical raiment to places of worship, we receive information on her cult in surprising detail, with thematically-fitting b/w-artworks complementing the material. Kala Môr is classified as a minor power, and author Daniel J. Bishop provides a smooth system to make the status of a deity actually mean something – gods and goddesses are ranked as greater, major, minor, lesser or least – this rank becomes relevant in the event of a spell duel, where invoking the patron, the lower-ranked caster reduced the spell-check by one step on the dice-chain – a minor power’s adherent fighting that of a greater power would hence reduce the dice used by two steps, to a d14. A god’s portfolio can increase this by one step – if a power has a portfolio and the other doesn’t and uses this in the invoked spell. Optionally, lesser and least powers may have caps in their spell-levels. This presentation and system are GENIUS – they take the unique features of DCC and translate them into a thoroughly smooth, simple and elegant rules-framework. Now back to Kala Môr – the power is described as having been brought into existence as a result of the Crimson Void coming into existence, acting now as a kind of warden against That Which Lies Beyond – culminating one prophesized day in a nasty Götterdämmerung – but for now, sacrifices must be made to keep the void at bay. Now allies and foes are all nice and dandy, but personally, I enjoyed seeing individual definitions of what is considered sinful and, obviously, omens. Judges will certainly appreciate that the pdf spills the beans regarding a crucial secret kept from even the highest clergy, though the inclusion of said information means that information, when handed out to players, should be redacted for maximum impact. Beyond the secrecy-themed spells, clerics may turn avian creatures. From void wolves to scarlet succubi, quite a few of these lethal adversaries have their very own b/w-artworks. Have I mentioned the immortal, unique spokes…entity of the Crimson Void, not included in the enumeration above? Yes, these things are intriguing! 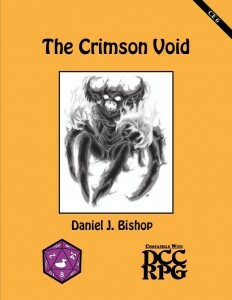 Speaking of which – the fully mapped high temple is depicted in compelling detail, with a significant array of read-aloud text…and potentially massive options for your players: Want to shut down the Crimson void forever and render Kala Môr mortal? Possible! Heck stats for her as a mortal have actually been provided – though, obviously, this deed is only something very powerful heroes can hope to accomplish. Going one step beyond, presences for holy services, etc. are provided and beyond this, the pdf’s main section closes with a distinct array of nice adventure hooks to get the maximum leverage out of this book. Obviously, the book also sports an appendix that details Kala Môr as a patron, complete with taint, spellburn, etc. – the section here is well-balanced against existing patrons – no complaints. The superb fifth Campaign Elements-pdf, Silent nightfall (srsly, check it out, even if you don’t play DCC) introduced demi-patrons and, for less scrupulous PCs, the Thing in the Void is depicted as just such a demi-patron, complete with taint, spellburn, etc. – once again, presented in a concise manner. My now gripe would be that I would have loved to see how this power’s abilities change upon being unleashed on the world…but that is just me wanting more, really. Editing and formatting are top-notch, I noticed no glitches. Layout adheres to a printer-friendly two-column b/w-standard with several nice, original pieces of b/w-artwork. The pdf comes fully bookmarked for your convenience. The cartography is clean and neat and the pdf provides the maps as high-res jpgs in both the regular AND a key-less, player-friendly version – kudos! Daniel J. Bishop single-handedly has made me play more DCC – his penmanship is stellar, covering both glorious ideas, far-out concepts and managing to capture a sense of sword and sorcery aesthetics that set him apart. It also helps that he’s not only a great author, he also knows his DCC-rules and manages to create, time and again, neat crunch to supplement his fluff. The Crimson Void is once again a testament of his glorious skill. While I personally prefer some of his other works over this, ultimately, I cannot field any proper and valid gripes against this pdf – it *is* absolutely great and we’re honestly moving in pretty lofty spaces. (Get it, because of Kala Môr’s portfolio? … I’m sorry, I’ll put a dime in the lame-groaner-jar…) This is a compelling and fun supplement and well worth a final verdict of 5 stars + seal of approval.